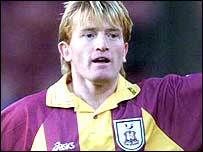 Stuart McCall has been confirmed as the new manager of Bradford City. Former Sheffield United assistant boss McCall, 42, will officially take over at Valley Parade - where he played for the club for 10 years - on 1 June. Chairman Julian Rhodes told the club's official website: "In light of intense media speculation, I'm delighted to announce Stuart is our new manager. "We weren't going to announce it until June but some people have been getting nervous so it's out in the open now." McCall was Neil Warnock's assistant at Bramall Lane for two years and was thought to be in the running for the Blades job when Warnock quit last week. But they are set to appoint Bryan Robson as the new manager and McCall has returned to Valley Parade, where he enjoyed two spells as a player. He began his career with the club in 1982, leaving in 1988 and after spells with Everton and Rangers he returned to play for four more years from 1998-2002. Bradford have revealed that defender David Wetherall, who took over as caretaker when Colin Todd left the club in February, will not be on McCall's coaching staff. Is McCall the right man for the Bradford job? However, the 36-year-old will continue as a player in League Two, after Bradford were relegated last season. "People might think I'm putting on a brave face but honestly I've got no issues with that," said Wetherall. "I will go back exactly to how it was before, although hopefully I will get involved with taking the reserves at some point, but I won't have an official coaching title and that's fine by me. "I'm totally relaxed about it and this means I can go back to playing, which I'm very happy to do."